OK, THERE ARE SOME THINGS IN LIFE THAT ARE MEANT TO BE, SOME THAT ARE NOT MEANT TO BE, AND SOME THAT I JUST HAVEN'T QUITE CATAGORIZED, LIKE MY CAT. MY CAT HAS A VERY FUNNY STORY ACTUALLY, SOME OF WHICH YOU HAVE HEARD, BUT THIS PHOTO CALLS FOR A FULL STORY TELLING, I BELIEVE. BRANDON HAS A COUSIN DOWN IN OTHELLO, THE WALKERS, THEY HAVE MANY CATS. THESE CATS ARE WILD CATS THAT JUST HANG AROUND, THEY ARE NOT FED, THEY HUNT TO EAT. WE WERE DOWN VISITING ONE DAY, AND THE KIDS AND I WERE SITTING ON THE FRONT PORCH, SURROUNDED BY CATS. THEY LOVE TO SEE IF YOU'LL FEED THEM! THERE WAS THIS BIG ORANGE FLUFFY ONE IN PARTICULAR THAT I WAS GIVING SPECIAL ATTENTION TO. I COMMENTED ON HOW GOOD LOOKING IT WAS AS I WAS HEADING TO MY CAR, AND JAN ( BRANDONS COUSIN ) ASKED ME TO PLEASE TAKE IT. SUPPRISED I ASKED WHY SHE DID NOT WHAT IT, IT WAS DEFINATELY THE BETTER LOOKING OF THE BUNCH. SHE STATED THAT IT WAS A HE, AND HE KEPT GETTING ALL THE FEMALES PREGNANT, HENCE THE "MANY" CATS SHE HAD. SHE SAID SHE HAD GIVEN IT AWAY THREE TIMES, BUT IT HAD FOUND IT'S WAY BACK HOME EVERY TIME. TO MY SURPRISE, BRANDON SAID SURE, WE'LL DUMP IT OFF AT OUR HOUSE AND IT'S SURE TO NOT FIND IT'S WAY BACK TO YOURS. WELL, WE PUT HIM IN THE VAN, AND OFF WE WENT. HE DID GOOD FOR NEVER RIDING IN THE CAR BEFORE, EXCEPT I STEPT OUTSIDE TO SAY GOODBYE TO SOME FRIENDS, AND HE STOLE MY TURKEY SANDWICH OFF THE FRONT DASHBOARD!, POOR THING PROBABLY STARVED TO DEATH. 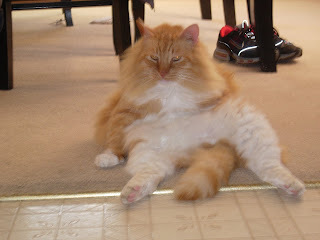 WELL, THE BIG, NOW FAT, ORANGE TABBY IS KNOWN AS OSCAR, AND HE IS NOTHING CLOSE TO BEING WILD. HE JUMPS UP AT MY WINDOWS THINKING HE CAN GET INSIDE, ONLY TO SLIDE BACK DOWN THE GLASS, HE LOVES CAT FOOD, EATS IT ALL DAY LONG, AND HE DOES NO SORT OF HUNTING, AT ALL! WE HAD A MOUSE RUN IN OUR HOUSE, WE CORNERED IT IN A ROOM, THREW IN THE CAT AND WAITED FOR DEFEAT. THE MOUSE RAN RIGHT INTO THE CAT, TURNED AROUND AND RAN THE OTHER WAY, AND OLD OSCAR JUST WATCHED HIM, DIDN'T EVEN BUDGE! NO OSCAR JUST DOESN'T HUNT ANYMORE, I GUESS WHY WOULD YOU IF YOU HAD MEALS BROUGHT TO YOU IN PLENTY, I WOULDN'T. WHEN WE LIVED IN OUR LITTLE BLUE HOUSE, HE WOULD SIT UP IN AN OLD TREE OUTSIDE THE PORCH AND WAIT FOR US TO GET HOME, THEN HE'D JUMP DOWN AND COME RUNNING. NOW AT OUR NEW OLD HOUSE, HE SITS IN THE SHED TILL MORNING WHERE I FIND HIM ON THE FRONT PORCH IN HIS USUAL SPOT. EVERYTIME HE SEES ME COME HOME, HE RUNS UP TO THE VAN AND GREETS ME AS I OPEN THE DOOR. SOUNDS MORE LIKE A FAITHFUL DOG DON'T YA THINK? I LET HIM INSIDE FOR A WHILE, ESPECIALLY WHEN ITS SO COLD. IF HE HAS TO GO TO THE BATHROOM, HE SITS BY THE FRONT DOOR TILL I LET HIME OUT, AMAZING, I HAD TO TEACH MY DOG TO DO THAT! WHEN HE'S HUNGRY, HE SITS BY THE COUNTER, WHERE I KEEP HIS FOOD, HE SITS PATIENTLY AND WHEN I ENTER THE ROOM, HE TELLS ME HE'S HUNGRY. WOW, I NEVER THOUGHT I WOULD HAVE SUCH AN OBEDIENT ANIMAL, ESPECIALLY A CAT. WELL, OSCAR IS NO LONGER A WILD FARM CAT, HE'S DEFINATLY DOMESTIC, HE WAS JUST WAITING FOR HIS CHANCE. THIS PHOTO JUST MAKES ME LAUGH BECAUSE, IT JUST DOESN'T LOOK NORMAL FOR A CAT TO SIT THIS WAY, BUT THEN AGAIN, I DIDN'T KNOW A WILD FARM CAT WOULD BE DOMESTICATED, WITH NO HELP. HE EVEN LETS THE KIDS LAY ON HIM FOR PILLOWS, AND PRESLEY JUST LOVES TO PULL HIS FUR! HE JUST SITS THERE, PURRS, AND WHEN HE'S TIRED OF IT HE GETS UP AND MOVES. MY LITTLE, WAIT, BIG ORANGE CAT HAS TAUGHT ME THAT LIFE IS WHAT YOU MAKE OF IT, IF YOU'RE NOT HAPPY BEING A FARM CAT, GET DOMESTICATED! IT DOESN'T MATTER HOW MANY WINDOWS YOU HAVE TO JUMP THROUGH, AND HIT, OR HOW MANY TREES YOU HAVE TO SIT UP IN AND WAIT. THERE IS ALWAYS SOMEONE, EVENTUALLY, WILLING TO LET YOU IN. DON'T GIVE UP ON WHAT YOU WANT IN LIFE, AND MAYBE ALONG THE WAY YOU'LL MAKE THE PEOPLE AROUND YOU HAPPIER TOO. ODE'S TO OSCAR! HE'S DEFINATLY EARNED HIS HOME. PRRRR!!!! That is definitely a cat worth keeping (but don't tell anyone I said that)! You had some really great profound thoughts, and I'm glad to have met you. Thanx for being so down to earth, and for being such a great listener! Ohhh...Oscar. He is a good cat, isn't he? I'm always surprised at how patient he is while Roman yanks on his fur and tries to poke his eyes. Who would've thought that he used to be wild? That pic of him is a classic. This was a cute post!! Super funny Pic!!! That is why I love cats! They have such personalities!